Classical language status for Mandya Kannada? If the face is the index of the mind, the forever-frowning visage of B.S. 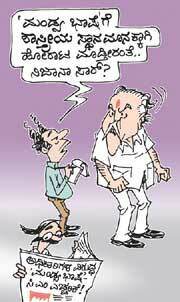 Yediyurappa contains an epic tale. The cartoonist P. Mahmud takes a much-deserved look at the chief minister whose use of the classical language with bureaucrats, among others, has been far from classical. This entry was posted in Issues and Ideas, Kannada & Karnataka, Media and tagged B.S. Yediyurappa, BJP, Churumuri, P. Mahmud, Praja Vani, Prajavani, Sans Serif. Bookmark the permalink. ಮ೦ಗ್ಯಾನಿ೦ದ ಮ೦ಡ್ಯಾ – ಯಡಿಯೂರಪ್ಪ ಬಾಯಲ್ಲಿ ವಿಕಾಸವಾದ!!! Three tears for the lost art of civility in public discourse. Why shuld we not be proud of this………. ?